Last week I had cause and reason to phone a specialist dentist’s office. You would not believe how badly the phone was answered. I can only think that their office is so busy that the best way for them to filter patients is to answer the phone without the receptionist engaging their brain firstly. Some form of music meant to appease me and placate me. No matter how busy you are and no matter how many people are in front of you in the office and no matter how many other phone lines you have going at that moment, the person calling in to your dental office, WHO YOU DON’T KNOW WHO THEY ARE NOR DO YOU KNOW WHAT THEY WANT TO GET DONE, that person must be made to feel as if they are the only person that you are speaking with and they must also be made to feel as if you have been waiting all day just for them to call you. And you only have one chance at making a good first impression. So you sure as heck have to make sure that you take that chance whenever you can. And offending the caller with your brevity and your haste in terminating that caller and sending them to the holding pen until you are so graciously ready to take the call. After all, how dare they interrupt you by ringing in when you are busy? So what do you do next if you really are busy when the phone rings? Answer the call with a smile on your face and with the greeting we mentioned above. Take the ten to thirty seconds to listen to the caller and what they ask you. Sometimes the call can be concluded there and then. What do you think Mrs. Jones is going to say? She’s going to say, “Of course, that’s OK.” in most instances. Mrs. Jones is so glad that she’s been greeted by a pleasant voice and she has not had to speak to a machine. [Remember, however long we say that we are going to take to return the call we must always be on time or slightly ahead of time in doing that. We must respect the caller’s time. In this case, it gives us the opportunity to start finalizing the conversation with the patient in front of us, if we so desire. Again, remember that the telephone is your friend. It is providing you with the opportunity of helping someone in need, and solving their problem. It is the opportunity for you to make someone’s day. And isn’t that a WIN-WIN situation? My next public speaking presentation showing Dentists how to grow their Dental practices will be in Melbourne Australia on Saturday 1 April 2017 with Jayne Bandy and Wolfgang Hofbauer. The failure of businesses to achieve their full potential of greatness comes down to one simple thing. If the business lacks direction, then like a river, it simply meanders looking for the point of least resistance to make some weak and feeble progress. Without a clear purpose, management and staff become unsure and uncertain of what or which is the best way to proceed. There is no clarity of purpose. Nobody in the organisation knows what EXACTLY is trying to be achieved. And as such, with one hundred percent certainty, that non-specific outcome is achieved each and every time. Could you give me a definitive answer? The purpose of your business should be your business’s Mission Statement. It should be the Vision for your business. And so everything that my business did, that my dentists did, that my team members did, was driven by that mantra. And everything that we did was held up and compared to that mantra to see that it lived up to it as a standard, THE standard, for what we were trying to achieve. Do you have a STANDARD to live up to? Is your dental practice known for its level of service? Is your dental practice known for its lack of service? 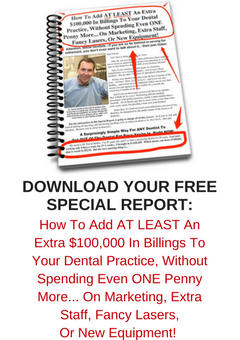 Is your dental practice known for its low prices? Is your dental practice known for its low prices BUT….? What do you want your Dental Practice to be known for? By striving to be the best and being known for the best service you will succeed. It is said that long after people forget what you did for them they will always remember how you made them feel. And if you make them feel special, as if they are the most important person in the world while you are with them, then they will be your customer for life, always returning and always referring. But to do that well, to do that successfully, you need to have that clear vision and mission for your business. Backing up that Vision Statement and Mission Statement are the clear and concise steps and directions that need to be taken and followed by everyone in your organisation so that the mission can be achieved easily and seamlessly each and every time. Everybody in the organisation needs to know exactly what to do in each and every situation that can possibly arise. Both in dealing with customers and patients as well as dealing with each other and with protocols and procedures. We cannot be operating in silos. Each and every duty and procedure within the business must relate back to the Mission Statement with clarity as to its purpose in the grand scheme of things. It is only when we have this connection, this true connection of purpose that we then have clarity as to exactly what we are doing and we understand the true reason why we are striving to achieve that result. Once we have that purpose, that Mission, then and only then do we have unity, true unity towards that common purpose. It is then that everything becomes meaningful. It is then and only then that things become clearer. It is then that we have truly understood what our clear next step is and why it is so important. When each and every team member understands their purpose and the importance of their role in the Mission of the business and the direction that this business is heading, it is then that we have true purpose. Because while ever there are team members who are unsure of their purpose or are not truly motivated, then our business has an Achilles Heel that will always have the potential to let us all down. For our business to be truly successful there must be no weaknesses within our business. And the best way to ensure no weaknesses is to create that common purpose, along with that culture of clarity, where everyone knows exactly what they are trying to achieve, and for what purpose. There is no point in telling people the intricacies of how to do things if they do not understand the purpose of what they need to do and how it fits into the grand scheme of things. Clarity for all, is king. In the delivery of World Class Dental Customer Service the most important outcome, or measure, is really quite simple. A successful dental practice must have one hundred percent of its scheduled appointments kept and attended by the patients who make those appointments. Any time that we have appointments missed or rescheduled by our patients means that we have failed our patients and ourselves. I can hear you screaming this now. In a perfect world we could achieve this. So why not create a perfect world? Why not have a dental practice where patients are beating a path to your door to be treated? Your dentists, your dental hygienists, and your dental team members must be such wonderful people that your patients just want to be their friend, regardless of what they do or perform as a living. You’ve heard it before and now I’m going to tell it to you again. But with a twist. If your patients LOVE you and love your team, then these patients will have no hesitations or reservations about making appointments to see you and your team for all of the dentistry that they need to have done. But if your patients fall short of loving you, then they will cancel appointments and delay and defer treatment, sometimes forever. And always to their own detriment. Bone loss will become worse. Bleeding and infection will remain. They will return and keep returning while ever they have and understand what needs to be done next for them. Patients must know exactly what is being done for them at their next visit. And they must know exactly what will happen to them if they do not have the treatment completed and over in the recommended time. The reason that patients do not make ongoing appointments, or they make appointments for treatment but have no intention of attending those appointments is because they have not been told clearly what is being done at the next visit. And they have not been told clearly what will happen to them if they do not get the treatment completed at the recommended time. Or sooner. Most dental practices are too vague when it comes to discussing with patients the outcomes of treatment and the consequences of delaying and deferring treatment. This may be because the dentist or the team members do not want to come across as “pushy”. But I contend that failing to convince patients to have the treatment they need that is best for their health is in fact professional negligence. I hear dentists say that they gave the patients all the options and the patient chose not to go ahead with treatment. I contend that the dentist has failed their patient if they did not give them sufficient compelling reasons to book and schedule their necessary and recommended treatment. And request to be contacted if an earlier appointment time. And have that treatment done. If as dental professionals we fail to have our treatment plans accepted then we have failed our patients and their ongoing well-being. We must have a vision of clarity for our business and our staff. This Vision of clarity must then be so compelling that it impacts profoundly upon those who come to us for treatment. Nobody in our business, be they an employee or an owner or a customer, should ever be in any doubt as to exactly what they need to do next, and they must also know exactly what will happen if they do not get done what is needed to be done within the recommended time frame. Once we have established this culture within our business that becomes recognised and appreciated by our loving and loyal customers, then we will automatically build a clientele of raving loyal fans who love us implicitly. And so if for some reason a difficulty arises that causes one of our patients to have to delay and reschedule their treatment then we have a choice of patients just willing to step up and have their necessary appointment brought forwards. If we are unclear we are doing nobody any favours. It’s not that we need to have scripts to try to prevent our patients calling in and cancelling. It’s not that we need to have scripts to close patients into appointments for treatment. It is simply that we need to have the relationships with our patients that they love us and respect us and trust us implicitly so that when we diagnose and plan treatment they are one hundred percent in agreement with all that we need to do for them. When I first started out in business as a Dentist I needed to find myself an accountant. A good friend recommended me to a friend of hers, who practiced accounting across the other side of town. On that first visit, as I was leaving his nice office, the phone rang. “Hello. This is Mark Holton. How can I help you? IT WAS CLASSIC SMOKE AND MIRRORS. By the name of the firm, you would have expected that M. K. Holton and Associates was more than an operation of one. Well it appeared to me that it was not. And to the caller, well, they may never have known that it was a firm of me, myself and I for Mr. Holton. Sometimes you need to act a little bigger than you are to get ahead or to get a foot in the door. Sometimes you need to “fake it until you make it”. Life is full of stories of people who have pushed the boundaries to obtain an edge. And with great success…..they’ve assumed a mantle, but then they’ve lived up to that assumption. Because as sure as eggs, society will not be tolerating any imposters, that’s for sure. If you can only talk the talk, but cannot walk the walk to back up your talk, well, you’re going to be struggling to be credible in the marketplace. THERE’S A TINY WINDOW OF OPPORTUNITY BEFORE THE HOUSE OF CARDS BLOWS OVER. So you need to make sure that what you do is backing up what you say. You cannot be a “Do as I say” person if you get busted for not doing. You need to back it up with reality, not fiction. STATISTICALLY, THERE AREN’T TOO MANY NATIONAL VELVETS OUT THERE. Most champion horses are bred from expensive stock and trained by great trainers. They are raised well, and fed well. National Velvet was a fairy tale. Sure, people win the lottery. But by and large, lottery winners do not graduate to the INC 500 or the BRW 200. A colleague of mine in the dental industry once told me that it takes ten years to become an overnight sensation in this industry. And it certainly doesn’t happen overnight. I remember the TV advertisement for the Commonwealth Bank MasterCard back in the 1980s…. I remember 2MMM’s Doug Mulray telling his listeners how excited they were because they had just seen the guy from that same bank’s TV advert lined up in the bank downstairs below the radio station. Trouble was he was lined up inside a rival bank. I don’t know what happened to Mr. Holton. A few months later on he sold his accountancy business, and a year after that I started using a different accountant. In 2014 when new owners took over the Dental Practice that I had sold in 2007 and worked on in, I made the difficult decision to walk away from the business that I had spent more than half of my life in, simply because I saw a conflict between what I had been saying for the previous twenty years, and the direction I was being asked to take, moving forwards. The actions and behaviours of some of the cast in this scenario were not to the same level of values that I had learned to uphold throughout my life. Life is really too short to be not living to high ideals. Or are you simply smoke and mirrors? I look at Dental Practice websites all the time. And I’m amazed at all the big words used on them. Who are these dentists trying to impress? Are they trying to impress their mothers? Are they trying to impress other dentists? Patients don’t understand big words. They don’t understand technical dental words and they certainly do not understand the identification of regular English words. They don’t understand these big words on websites and they certainly don’t understand these big words when they are spoken at the dentist. A patient doesn’t really have any idea what a preventive maintenance examination is? Is it some form of test? Like a school examination? Isn’t it something that your high performance European car should be having? A twenty-six point preventive maintenance examination? I once heard a dentist tell a patient that their “tooth could become problematic”. Why not simply tell the patient that the tooth could start to hurt…. The patient will understand that one..
Problematic? Symptomatic? Automatic? Autonomic? Hydrodynamic? I’m thinking, maybe “conducting” an orchestra? Or a bus? They don’t come back to get fillings. But they do come back…. Patients do not want to have decay in their teeth. Patients understand that decay is something that rots their teeth. Patients understand that decay is not static. It grows. Like a conservative political view? What does that mean to the patient? All the patient wants is for you to fix the tooth so it won’t hurt them. Patients presume and assume that all dentists treat teeth in a conservative manner. Patients have no idea what the opposite of conservative is in this case…..
And it just doesn’t stop there in the treatment room…. When the bewildered patient and their thesaurus arrive back at the front desk following treatment, they are bombarded with more jargon and big words. Firstly, we are assuming that urgency about the next visit has been created with clarity by the dentist and the dental assistant. And then go ahead and make the booking…. Have you ever noticed that confused people just nod their heads and go along with things…..
Rather than make themselves look stupid? That’s what happens when you use big words… the other person sometimes just agrees so as not to look stupid. I once saw a comedian in America showing an audience a fine polished piece of wood that he had crafted. And many in the audience nodded in agreement. The comedian then explained to the audience, made up mostly of dentists, that the word “lavernous” was not a real word, but rather one that he had made up. And he was surprised at how many of the audience just nodded and agreed with him about how lavernous his piece of wood looked…. Our patients do exactly the same thing when we speak big words to them. And then later, usually when they get home, they call back and cancel their appointment. Always make sure that all communication in your dental office is one hundred percent understood. Just because you know what big words mean, doesn’t mean that your staff and your patients know and understand. And remember, sometimes small is better.